Dyspnoea (breathlessness) is an uncomfortable awareness of breathing that occurs in approximately 30-75% of terminal cancer patients. It is one of the most distressing symptoms for both patients and family members and can seriously impact on quality of life. Typically, dyspnoea is associated with congestive heart failure, end-stage chronic obstructive pulmonary disease, or lung cancer. This book provides palliative care doctors and specialist nurses with practicalguidelines to help manage and treat patients with breathlessness. It includes the science behind the symptom in an attempt to explain the pathology and physiology of this complex condition. The book has been organized to address generalized aspects of breathlessness in advanced illness and more specific aetiologies and managements relevant to particular underlying diseases. It summarizes the epidemiology and the pathophysiology of breathlessness, measurement, research approaches, rehabilitation and exercise, clinical approaches that can be taken at the bedside, pharmacological and non-pharmacological approaches, and surgical interventions. 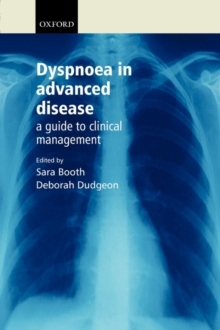 The care of patients with dyspnoea requires input from a variety of disciplines such as palliative care, physiotherapy, respiratory medicine and nursing, and this is reflected in the multidisciplinary list of contributors.